This Autumn The Folio Society welcomes in the new season with a batch of books which celebrate the very best big screen stories… from Black Beauty, to Sherlock Holmes, from James Bond, to iconic science-fiction. Included in the new releases are two high-anticipated illustrated ‘firsts’: Heinlein’s Starship Troopers and Steinbeck’s Of Mice And Men. Neither have been released in an illustrated edition before. Robert A. Heinlein is widely celebrated as one of the science fiction greats and the Folio Society will be releasing their gift edition of his Hugo Award winning tale, just in time for Christmas. Adapted for the big screen by Paul Verhoeven in 1997, Starship Troopers, the tale of a military dystopian future spawned five spin-offs including last year’s animated Starship Troopers: Traitor Of Mars. The original novel is an equally grim tale in which Earth is caught in the midst of a deadly conflict with the implacable ‘Arachnids’, a swarm of insect-like aliens intent on wiping out all human life. Fresh recruit Juan ‘Johnny’ Rico signs up impulsively, keen to prove himself in the upper echelons of the Navy. Instead he finds himself assigned to the Mobile Infantry, the frontline where all that stands between life and an alien death is a sophisticated armoured suit. 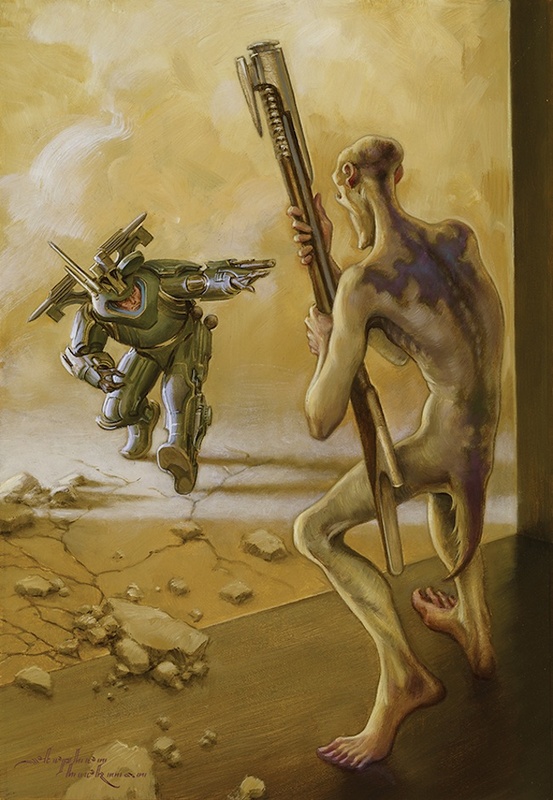 Above: Illustration ©2018 Stephen Hickman from The Folio Society edition of Robert A. Heinlein’s Starship Troopers. 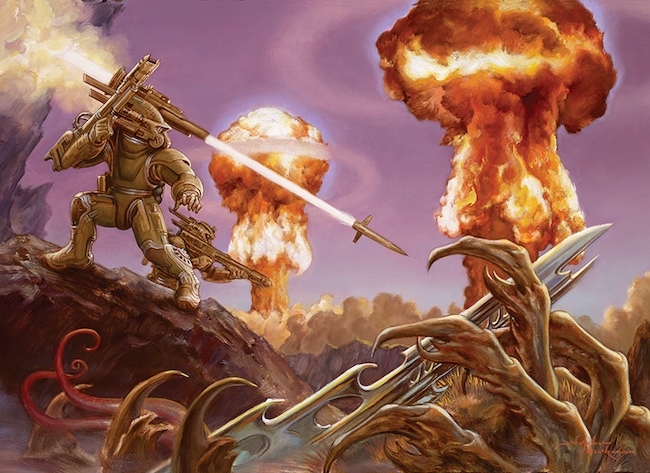 Based on Heinlein’s own experiences of serving in the military, the book remains controversial, especially its central argument that violent conflict is an inevitable and necessary part of human civilisation. The Folio’s edition places Heinlein in context with an introduction from Joe Haldeman, author of The Forever War, who talks about the influence Starship Troopers had on his own work, and how the fallout from Vietnam changed the face of American speculative fiction. It’s—as one would expect—an intelligent and thoughtful analysis of a difficult book and, while it doesn’t make Troopers an easier read, it does give you an insight into both sides of the argument. 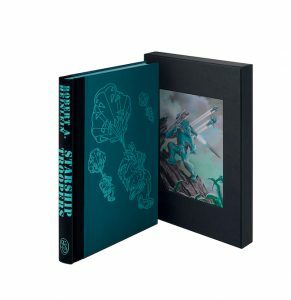 For this, the first illustrated edition, celebrated science fiction and fantasy illustrator Stephen Hickman has created seven illustrations, with two double-page spreads. Hugo Award winner and known throughout the SFF community for his work inspired by writers such as J. R. R. Tolkien, Larry Niven and Anne McCaffrey, Hickman brings fantastical space opera to each full-colour page, conjuring vast spaceships, unsettling chitinous legs and dreamy plumes of nuclear flame. The over all feel is of a 1950s boy’s own adventure, full of bold colour palates, dramatic perspective and tantalising possibilities. Additional black and white sketches look like they’ve jumped straight from the pages of a vintage Howling Commandos comic. 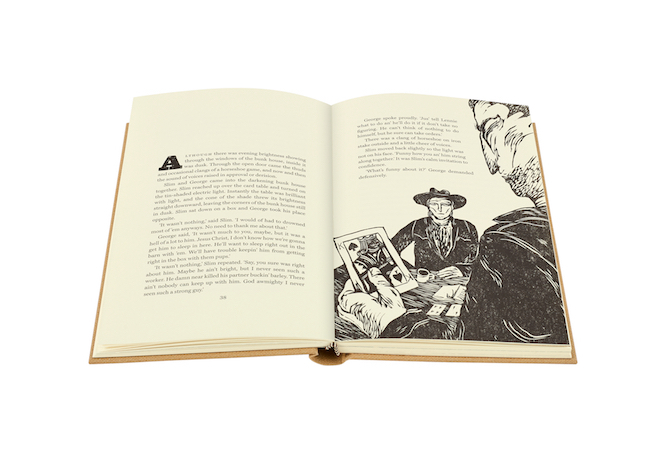 The edition is quarter-bound in blocked cloth with blocked metallic paper sides and metallic coloured page edges which echo the colour of the endpapers and embossed title. Alongside Heinlein, this Autumn’s Foilo releases also include another much-loved big screen classic: Of Mice And Men. 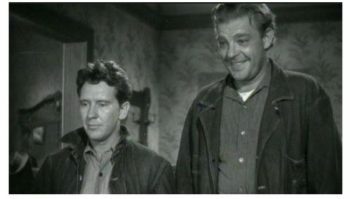 Adapted for both TV and film at least half a dozen times, the best remembered is probably the 1939 version starring Lon Chaney Jr. (Wolf Man) and Burgess Meredith (Batman). John Steinbeck’s electrifying tale of injustice and shattered dreams, is set during the Great Depression and follows the tale of migrant labourers George and Lennie. 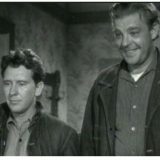 George is slight and savvy; Lennie a hulking simpleton and the pair has formed an unlikely friendship. They wander state to state, working on ranches and sleeping rough between jobs, until Lennie’s childlike naivety inevitably lands him in trouble and they must once again move on. Above: The Folio Society edition of Mice and Men by John Steinbeck. Steinbeck’s sparse narrative is suggestive of a stage play—in fact it has been adapted for the stage many times— and his gift for relating complex human sentiments with the briefest authorial direction is unsurpassed. 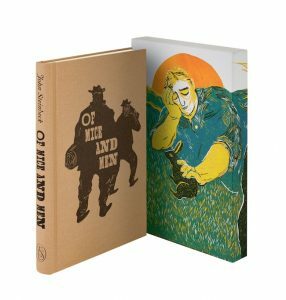 The characters are drawn with confident self-restraint that borders on detachment; Steinbeck sets the scene then pulls back to allow them space to tell their story. The effect is overpowering and ensures this thought-provoking novella will endlessly gnaw at the reader’s conscience. 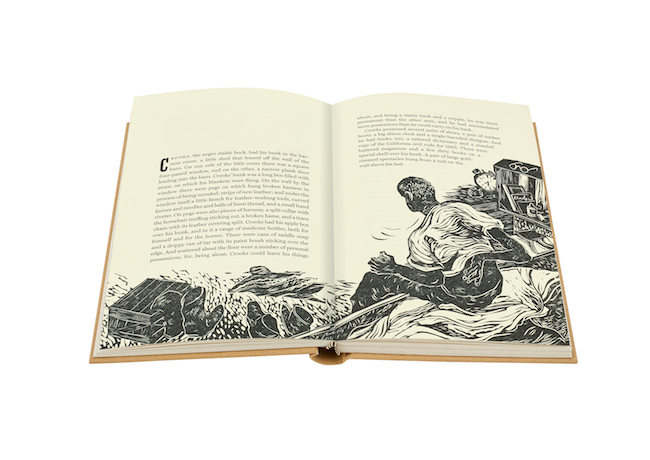 For this volume, award-winning illustrator James Albon has a series of striking colour linocuts, including two double-page spreads, as well as six black and white integrated images. Albon was so moved by the book that he created the poignant image of Lennie sleeping as a personal project before being awarded the commission. 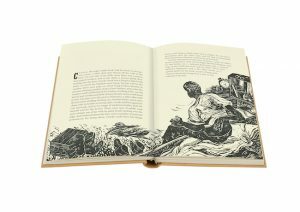 The image which was eventually used as a wraparound on the slipcase, conjures up swirling landscapes and the soft, muted colours of a dreamscape.